As well, it is with great sadness that we learnt of the death of Prof. Dr. Valentin I. Grishchenko. Prof. Dr. Valentin I. Grishchenko was born on November 27th, 1928 in Ukraine. Prof. Dr. Grishchenko was Director of the Institute for Problems of Cryobiology and Cryomedicine of the Ukrainian Academy of Sciences, Fellow of the Society of Cryobiology and Editor-in-Chief of the Journal of the Problems of Cryobiology in Charkiv, Ukraine. 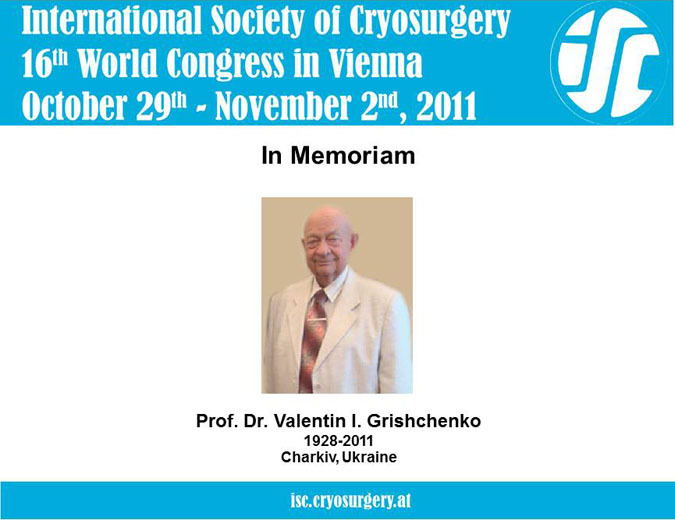 Prof. Grishchenko was staunch supporter of the International Society of Cryobiology and Japan Society for Low Temperature Medicine in several years. Prof. Dr. Grishchenko has dead in Charkiv, Ukraine on January 3rd, this year. Now is a minute's silence in commemoration of Prof. Dr. Valentin I. Grishchenko.